Combine felt applique, sewing and hand embroidery to make this adorable Wall quilt. Includes a mama pig and her little piglet with some ears of corn and a hen with her chick and some chicks-to-be. 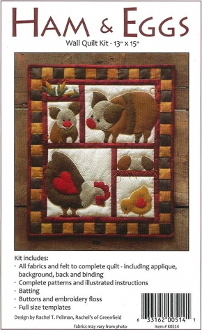 Kit includes: All fabrics and felt to complete quilt - including applique, background, back and binding. Complete patterns illustrated instructions. Batting. Buttons and embroidery floss. Full size templates.